From the Arctic’s narwhals, to the Atlantic’s belugas, to the Pacific’s sea otters – marine mammals are tied to our identity, capture our imaginations, and play critical roles in the ecosystems they inhabit. Over 40 species of marine mammals make their home within Canada’s oceans. These species are facing increasing stress from rising human activity and depletion of the prey they rely upon for food. Fourteen populations of marine mammals in Canada, including the St. Lawrence Estuary beluga whales, southern resident and northern resident killer whales, and the North Atlantic right whales, are listed under the Species At Risk Act (SARA) as being either Endangered or Threatened. Despite being listed, these populations have continued to decline toward stages of crisis. One way to address these stressors is to keep areas that are important to marine mammals “stress-free” by protecting them. Marine protected areas (MPAs) are areas specifically reserved for protection, but to be effective, they need strong and consistent laws that prohibit damaging activities and provide safe havens. Commercial shipping and fishing are among the activities that pose threats to marine mammal populations. 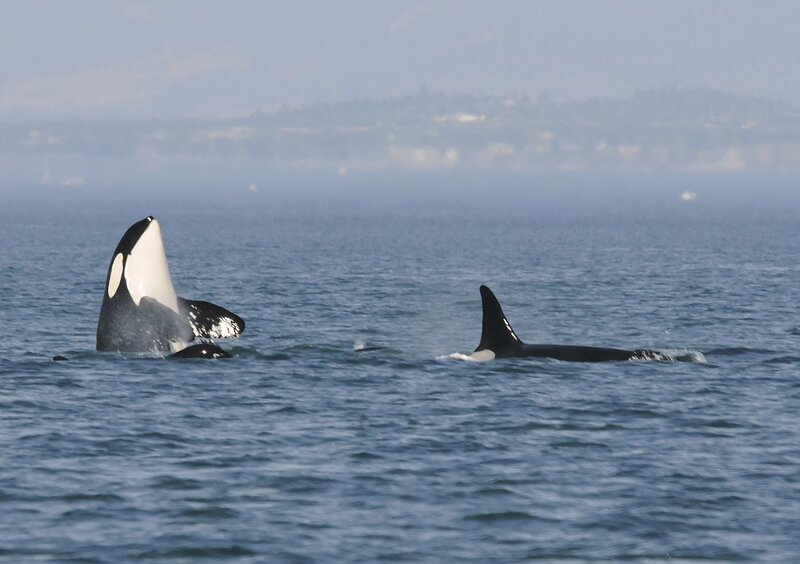 The southern resident killer whales suffer from impacts of increased vessel traffic noise and reductions in their primary prey: Chinook salmon. At the same time, another J Pod member named Scarlet (J50) was ailing, which prompted a sudden flurry of activity among both Canadian and American biologists, including administration of antibiotics. Devastatingly, in mid-September, after several days of no sightings, J50 was presumed to have died. And just weeks ago, photos of K25 or Scoter, a member of the K Pod, showed that the male orca has lost significant weight. The southern resident killer whales were recognized as endangered under SARA in 2002, but it has taken these devastating stories of whales in crisis to spur initial action by the Canadian government. In May, the federal government announced a reduction in harvest of Chinook salmon – the primary food source for the southern residents – by roughly one-third, as well as closures in some key whale foraging areas. However, studies and surveys have shown that greater closures and more action is needed for the whales to access their prey. Revisions to Canada’s Marine Mammal Regulations this summer offer some increased protection for killer whales and other marine mammals from vessel traffic, though these revisions were in preparation for over a decade before being established. A recent audit from Canada’s Commissioner on Environment and Sustainability sheds some light on this reactive approach to protecting marine mammals. The report from this audit, released earlier this month, focused specifically on whether the federal departments with responsibilities and jurisdictions to protect marine mammals within Canada were adequately addressing threats posed by commercial fishing and shipping. For the 14 marine mammal populations listed as endangered or threatened under SARA, 11 have been listed for over a decade and only three have had any specific management measures implemented to reduce the threats posed by commercial fishing and marine vessels. Recovery strategies and action plans are used to identify what needs to be done to arrest or reverse the decline of a species listed under SARA. Unfortunately, they have been chronically slow. Only four recovery strategies have been completed within the window of time required under the Act. No action plans have been completed on time. Though the Species at Risk Act presents a tool for the government to plan and enact protections for declining species, the Commissioner’s audit highlighted that the slow pace of implementation prevents effective protection of these mammals. Even for those populations that have recovery strategies and plans in place, few management measures had been implemented, and government reviews have found that that these measures were not sufficient to address the threats posed to listed populations of marine mammals. A particular focus of the Commissioner’s report was on protections afforded to marine mammals by MPAs established by the federal government. As a spatial tool, MPAs can be used to reduce threats within areas identified as important to populations of marine mammals. Commercial fishing was prohibited in 17% of the area within MPAs. Commercial marine vessels were prohibited in 10% of the area within MPAs. Three of the 11 MPAs designated by Fisheries and Oceans Canada have specific objectives relating to protecting marine mammals for their establishment, but even these three had few restrictions on commercial fishing and had no restrictions on marine vessel traffic. Of the 34 fishery closures that are being counted toward Canada’s marine biodiversity conservation targets, only two are in place with the intention of protecting marine mammals. The federal government has no shortage of tools to use to protect marine mammals: of the six laws governing marine protected areas, five provide the legal authority to restrict commercial fishing and vessel traffic within marine protected areas. The Fisheries Act and the Canada Shipping Act can also be used to protect species from human activities within marine protected areas by implementing initiatives such as shipping corridors, reducing vessel speeds within MPAs, and enacting fishery restrictions or closures. Last week, Canada’s National Advisory Panel on Marine Protected Area Standards released its recommendations to improve the effectiveness of MPAs. National Advisory Panel recommendations — What can be done? The Panel recommends that a standard be adopted for MPAs in Canada, meaning that at minimum, all MPAs should prohibit industrial activities such as oil and gas exploration and exploitation, mining, dumping, and bottom trawl fishing. Additionally, the Panel says that when industrial activities are allowed to occur in areas counted toward our conservation targets (such as “other effective area-based conservation measures” or OECMs), effective legislation or regulation must be in place to protect the marine ecosystems within these protected areas. However, the Panel did not mention other protection standards that have been recommended by West Coast, other ENGOs and scientists – such as establishing complete no-take zones within MPAs (areas where all commercial and recreational fishing is prohibited). Implementing standards is a proactive and precautionary way to protect marine mammals and the marine ecosystems that they rely upon. Both the Commissioner’s audit and the National Advisory Panel report demonstrate the need for Canada to pay greater attention to marine mammals in planning and regulating MPAs. Strongly protected MPAs benefit marine mammals and the marine ecosystems they rely upon, by protecting access to important habitats and maintaining the quality of habitat that they need to survive. MPAs can protect key habitat areas for marine mammals, such as feeding, wintering, breeding, or resting areas, as well as migratory routes. In 2003, the International Maritime Organization re-routed ship navigation in the Bay of Fundy to reduce the risk of lethal vessel strikes to North Atlantic right whales. In 2008, the route was declared an “Area To Be Avoided” for ship traffic within the Roseway Basin on the Scotian Shelf. This voluntary conservation initiative to protect the right whales from vessel strikes has greatly reduced risk to right whales. In 2017, a voluntary vessel slowdown trial in Haro Strait in the Salish Sea demonstrated that reducing vessel speeds is an effective way of lessening the underwater noise generated by vessels. This also lowers total underwater noise in nearby habitats, which may in turn benefit the behaviour and feeding success of the endangered southern resident killer whales. This voluntary slowdown was continued in 2018. The Michael Bigg Ecological Reserve was established in 1982 to protect a 12.4-km2 area within identified critical habitat for the northern resident killer whale, listed as Threatened under Canada’s Species At Risk Act. The Reserve prohibits entry to all boaters (motorized and non-motorized) to reduce disturbance to these whales while they feed, socialize and use rubbing beaches. The two independent reports released this month both highlight the need for increased protection for marine habitats and wildlife, and both provide concrete recommendations for the federal government to act upon. The southern resident killer whales can’t wait – there is an urgent need to protect areas to reduce pressure within important feeding areas and enable population recovery. We can protect areas of the ocean now to safeguard marine mammal populations from future stressors.